This updated and expanded edition of the best-selling fundraising resource The Ask gives anyone who needs to learn how to ask--for their nonprofit organization, creative project, business venture, or simply for themselves--all the right steps and language to make the best Ask. 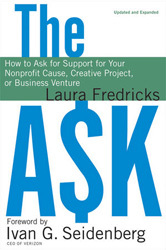 Written by fundraising expert Laura Fredricks, The Ask is filled with numerous sample dialogues that any reader can use and adapt immediately. Her engaging, entertaining, and inspirational style of writing will transform anyone's fear of asking into an action plan to make the right Ask. This book is written for anyone who wants to develop the fundraising skills needed to achieve greater success and learn how to ask with confidence.